I was trying to make a pair of shorts the other day, and I thought that I MUST have some appropriate fabric in my stash. After all, shorts doesn´t take that much fabric! I did find some fabric for my shorts. I also found the insight of the necessity of going through my stash. Again. A little warning for the newbie-sewer: I have only been sewing since 2005, and on top of that, really haven´t made a conscious choice to build a stash. And, I´m not especially rich or anything, I can´t buy everything I want. I usually get my stash on sale or I thrift. Still, my stash has grown completely out of control! So be ware! The good thing about fabric, is that it doesn´t take up that much room. The bad thing about fabric, is that is doesn´t take up that much room. Each individual piece, that is. But when all of these little pieces come togheter, it´s one BIG party. Too big for my appartement. So I am taking control over the situation. 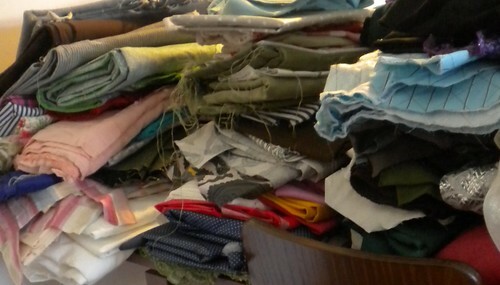 From these findings, I draw the conclusion that my favorite past time activity is to sew clothing…. 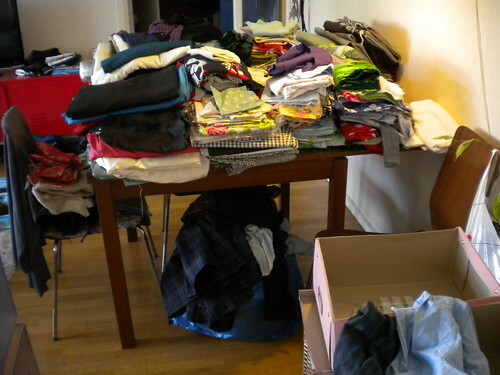 To get some system in all of this, I sorted my apparel fabric in first two parts, then in several smaller ones. After having sorted through everything, I feel much more at ease. I have pulled out all the fabric for stuff I want to make this season, and put everything else in clearly marked boxes. I now even have a designated place for my interfacing! I never had that before. Oh the joys of organizing! I got rid of all of the smallest scraps and bits and pieces, and now that everything is organized, I actually know that I for instance have lining for every pocket I would want to make in the near future, I´ve got some seriously great looking silk fabrics I´m dying to use, and I can make several coats and jackets for the upcoming colder season. Who new? In addition to my newly organized stash, there are some gorgeous fabrics just waiting to be shipped to me at my parents house as well. My mother did some de-stashing this summer, and amongst other stuff there was a little something for me. Where I will place all of that fabric when it comes my way, will be a problem for later. For now, I am happily sewing through my stash! How inspirational!! You are leading a fine example and are a couple of weeks ( maybe) ahead of me in doing the same. Mine feels like it is in piles just because I know I’m moving sewing rooms soon….. And there will start the grand organisation. It will feel so good. Can’t promise to make charts though!! Ooo, a new sewing room, how exciting! A great excuse for sorting through everything! I decided earlier this year,after a bit of a lull in sewing over the winter what with having work done to the house amongst other things,that to get rid of a lot of fabric that was just hanging around I would make a rag rug out of it.This was all well and good but then I started to get fabric from charity shops for the rug because the stuff that I did have wasn’t suitable for one reason or another or I just didn’t want to waste it on a rug.And of course buying fabric for the rug meant that I started buying fabric for “other Purposes” and “just in case” and before you know it I am back fanatically sewing and making clothes.My stash is increasing but is nothing like it was a few years ago before I moved to this house.I had so much fabric then and I just gave it all away…stupidly.But when I think of all the fabric that I have acquired in such a short time I think that I really have a problem! My rug is nearly finished by the way!! Oh, I hear you on that one! And making a rug! That´s so nice! I´ve been wanting to try that out one day, I actually have a loom as well, but unfortunately no room for it (yet). Haha! Those charts are a riot. But also very smart, very smart indeed. Maybe when I have time I can chart my fabric too! Great post – I love the diagrams. I agree organising it all is rewarding, I need to do that myself.